An allele (/əˈliːl/)  is the variant form of a given gene. Sometimes, different alleles can result in different observable phenotypic traits, such as different pigmentation. However, most genetic variations result in little or no observable variation. The word "allele" is a short form of allelomorph ("other form", a word coined by William Bateson), which was used in the early days of genetics to describe variant forms of a gene detected as different phenotypes. It derives from the Greek prefix ἀλλήλ, allel, meaning "reciprocal" or "each other", which itself is related to the Greek adjective ἄλλος (allos; cognate with Latin "alius"), meaning "other". Most multicellular organisms have two sets of chromosomes; that is, they are diploid. These chromosomes are referred to as homologous chromosomes. If both alleles at a gene (or locus) on the homologous chromosomes are the same, they and the organism are homozygous with respect to that gene (or locus). If the alleles are different, they and the organism are heterozygous with respect to that gene. In many cases, genotypic interactions between the two alleles at a locus can be described as dominant or recessive, according to which of the two homozygous phenotypes the heterozygote most resembles. Where the heterozygote is indistinguishable from one of the homozygotes, the allele involved is said to be dominant to the other, which is said to be recessive to the former. The degree and pattern of dominance varies among loci. This type of interaction was first formally described by Gregor Mendel. However, many traits defy this simple categorization and the phenotypes are modeled by co-dominance and polygenic inheritance. The term "wild type" allele is sometimes used to describe an allele that is thought to contribute to the typical phenotypic character as seen in "wild" populations of organisms, such as fruit flies (Drosophila melanogaster). Such a "wild type" allele was historically regarded as dominant (overpowering - always expressed), common, and normal, in contrast to "mutant" alleles regarded as recessive, rare, and frequently deleterious. It was formerly thought that most individuals were homozygous for the "wild type" allele at most gene loci, and that any alternative "mutant" allele was found in homozygous form in a small minority of "affected" individuals, often as genetic diseases, and more frequently in heterozygous form in "carriers" for the mutant allele. It is now appreciated that most or all gene loci are highly polymorphic, with multiple alleles, whose frequencies vary from population to population, and that a great deal of genetic variation is hidden in the form of alleles that do not produce obvious phenotypic differences. 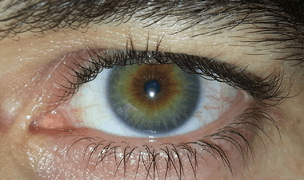 Eye color is an inherited trait influenced by more than one gene, including OCA2 and HERC2. The interaction of multiple genes—and the variation in these genes ("alleles") between individuals—help to determine a person's eye color phenotype. 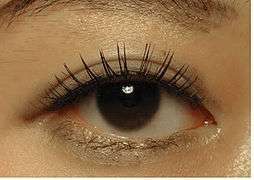 Eye color is influenced by pigmentation of the iris and the frequency-dependence of the light scattering by the turbid medium within the stroma of the iris. 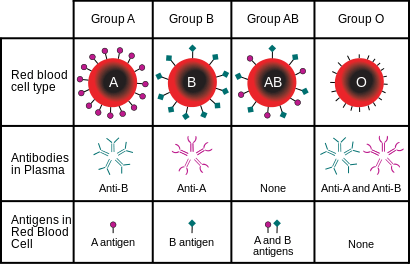 In the ABO blood group system, a person with Type A blood displays A-antigens and may have a genotype IAIA or IAi. A person with Type B blood displays B-antigens and may have the genotype IBIB or IBi. A person with Type AB blood displays both A- and B-antigens and has the genotype IAIB and a person with Type O blood, displaying neither antigen, has the genotype ii. A population or species of organisms typically includes multiple alleles at each locus among various individuals. Allelic variation at a locus is measurable as the number of alleles (polymorphism) present, or the proportion of heterozygotes in the population. A null allele is a gene variant that lacks the gene's normal function because it either is not expressed, or the expressed protein is inactive. where p is the frequency of one allele and q is the frequency of the alternative allele, which necessarily sum to unity. Then, p2 is the fraction of the population homozygous for the first allele, 2pq is the fraction of heterozygotes, and q2 is the fraction homozygous for the alternative allele. If the first allele is dominant to the second then the fraction of the population that will show the dominant phenotype is p2 + 2pq, and the fraction with the recessive phenotype is q2. A number of genetic disorders are caused when an individual inherits two recessive alleles for a single-gene trait. Recessive genetic disorders include albinism, cystic fibrosis, galactosemia, phenylketonuria (PKU), and Tay–Sachs disease. Other disorders are also due to recessive alleles, but because the gene locus is located on the X chromosome, so that males have only one copy (that is, they are hemizygous), they are more frequent in males than in females. Examples include red-green color blindness and fragile X syndrome. While heritable traits are typically studied in terms of genetic alleles, epigenetic marks such as DNA methylation can be inherited at specific genomic regions in certain species, a process termed transgenerational epigenetic inheritance. The term epiallele is used to distinguish these heritable marks from traditional alleles, which are defined by nucleotide sequence. A specific class of epiallele, the metastable epialleles, has been discovered in mice and in humans which is characterized by stochastic (probabilistic) establishment of epigenetic state that can be mitotically inherited. ↑ Wood, E.J. (1995). "The encyclopedia of molecular biology". Biochemical Education. 23 (2): 1165. doi:10.1016/0307-4412(95)90659-2. ↑ Craft, Jude (2013). "Genes and genetics: the language of scientific discovery". Genes and genetics. Oxford English Dictionary. Retrieved 2016-01-14. ↑ Victor A. McKusick; Cassandra L. Kniffin; Paul J. Converse; Ada Hamosh (10 November 2009). "ABO Glycosyltransferase; ABO". Online Mendelian Inheritance in Man. National Library of Medicine. Archived from the original on 16 November 2010. Retrieved 24 March 2010. ↑ Yip SP (January 2002). "Sequence variation at the human ABO locus". Annals of Human Genetics. 66 (1): 1–27. doi:10.1017/S0003480001008995. PMID 12014997. ↑ Daxinger, Lucia; Whitelaw, Emma (31 January 2012). "Understanding transgenerational epigenetic inheritance via the gametes in mammals". Nature Reviews Genetics. 13 (3): 155. doi:10.1038/nrg3188. ↑ Rakyan, Vardhman K; Blewitt, Marnie E; Druker, Riki; Preis, Jost I; Whitelaw, Emma (July 2002). "Metastable epialleles in mammals". Trends in Genetics. 18 (7): 348–351. doi:10.1016/S0168-9525(02)02709-9. ↑ Waterland, RA; Dolinoy, DC; Lin, JR; Smith, CA; Shi, X; Tahiliani, KG (September 2006). "Maternal methyl supplements increase offspring DNA methylation at Axin Fused.". Genesis (New York, N.Y. : 2000). 44 (9): 401–6. doi:10.1002/dvg.20230. PMID 16868943. Look up allele in Wiktionary, the free dictionary.